High quality bleach proof hand towels used in hair salons, nail salons or any business looking for towels which can be washed in bleach. Standard size of 16x26 extra soft and high end deluxe quality. Why do so many salons opt for white hand towels? The answer is clear: They worry about bleaching, chemical agents and dyes spotting and staining other types of wholesale hand towels. This is totally understandable, especially among salon owners who have had to constantly re-purchase black hand towels. There are few things more frustrating than ordering discount black hand towels, throwing them in the wash, and discovering that they’re not bleach safe. 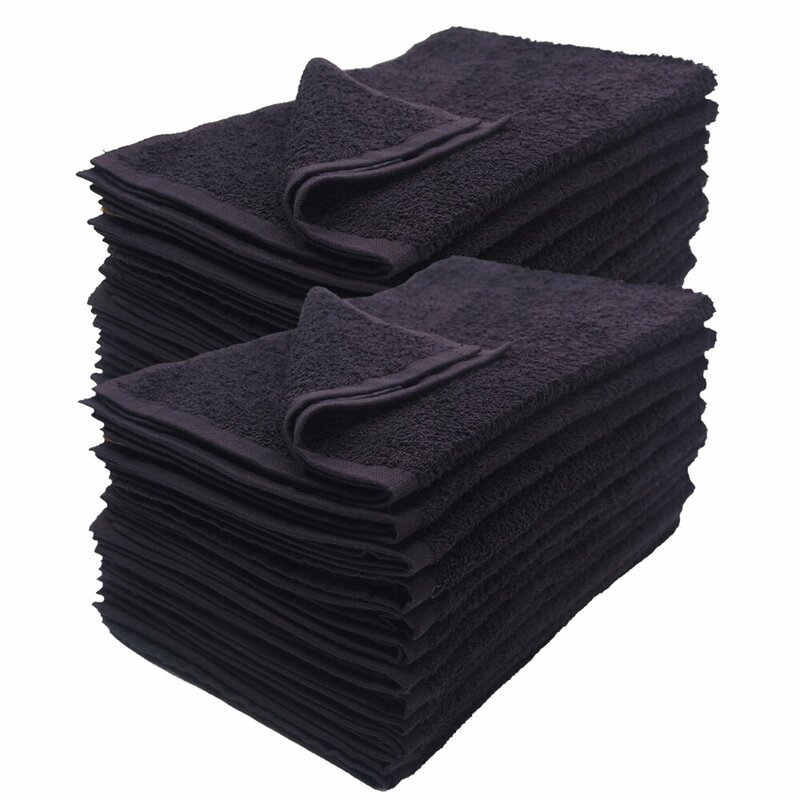 Towel Super Center sells bleach-resistant black hand towels at wholesale pricing — which means you get the quality, durability and pricing you deserve! If you have someone in your home who uses black hand towels to remove makeup, dye hair, clean up nail chemicals, etc., you will love these bleach-resistant hand towels. They keep their shape beautifully while resisting any kind of spotting or staining. Parents of teens who like to switch up their hair colors or practice a variety of make-up applications will especially appreciate having black bleach-resistant hand towels. Just pop the towels into the laundry after every use and dry them until the cotton fibers have released all their moisture. They'll be fluffy and stain-free use after use. Want to set your salon apart from your competition? Why not offer black hand towels instead of white ones? With our black bleach-resistant hand towels, you get the longevity of white hand towels in a strong, intense, sophisticated black hue. You won’t believe how easy it is to save money on the bleach-resistant towels you need for your business or home. When you shop at Towel Super Center, you’ll join our customer base of savvy hotels, clubs and gyms that make wise budget decisions every day. We have the lowest wholesale pricing as well as a great selection of linens that provide you with unbeatable value! Isn’t it time you got the selection, value and service you deserve? Shop Towel Super Center today! Only product our Salon uses! These towels are Reliable, durable and super affordable. Completely bleach, and color safe.